Underfloor heating and radiators are regularly used together. Many of our customers have installed underfloor heating on the ground floor and radiators on the upper floors, and vice versa. Keeping your existing radiators in upstairs rooms is certainly a cost efficient alternative. Your existing boiler (if suitable) should provide hot water for both heating systems, as well as hot water for showers, baths etc. 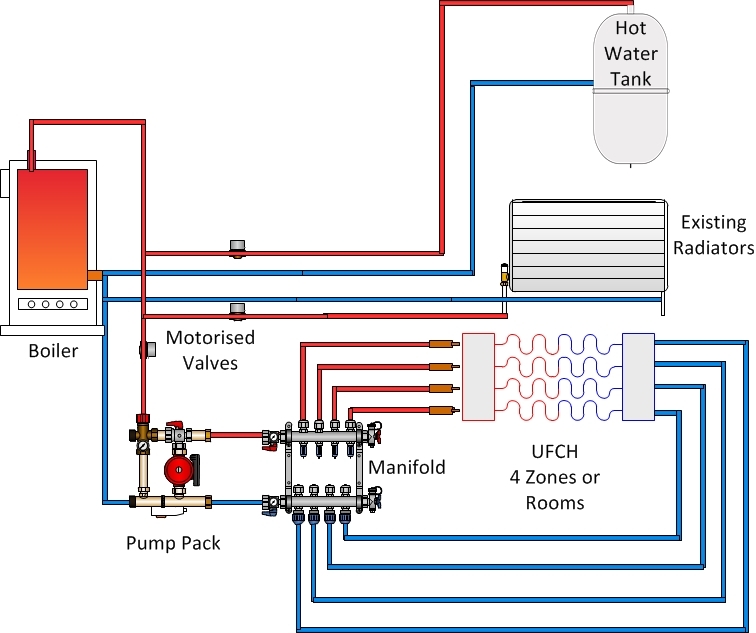 The diagram shows an outline of a four circuit underfloor system connected to an existing heating system. The boiler feeds three water circuits. Water flow is controlled by motorised valves. Circuit 1. A hot water circuit from the boiler goes directly to the radiator system and returns to the boiler. Circuit 2. The hot water cylinder is fed directly and returns to the boiler. Circuit 3. The underfloor heating system has a new water circuit from the boiler. This third circuit has a pump pack fitted, basically a pump and a set of valves. This feeds a manifold which splits into four zones or rooms. You can have a single circuit up to a maximum of twelve depending on the manifold. Your hot water supply and radiators use a timer and temperature controller. The underfloor heating system uses a new set of programmable room thermostats. You can add wiring centres to your heating system, these can control the boiler and a set of motorised valves that allow hot water to enter the radiators and underfloor circuits.